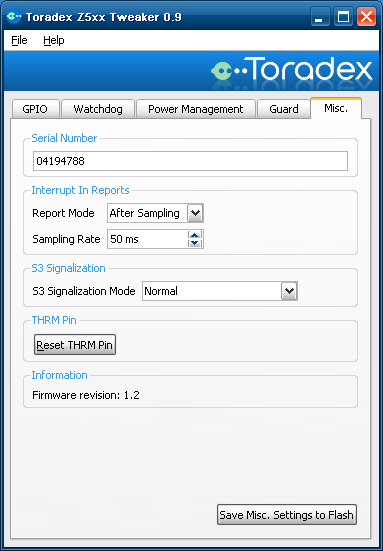 The Toradex Z5xx Tweaker Tool is a powerful tool for setting the Embedded Controller functions. The tool is currently running only under Windows XP and Windows Embedded Standard. Please download the program here. The tool reads the current settings of the Embedded Controller during the start of the program. Every change that is done in the program is directly written to the volatile memory of the embedded controller. If the settings have to be persistent, there is a save-to-flash-button for every function block available. For more information to the different Embedded Controller settings, please read the data sheet of the respective computer module. 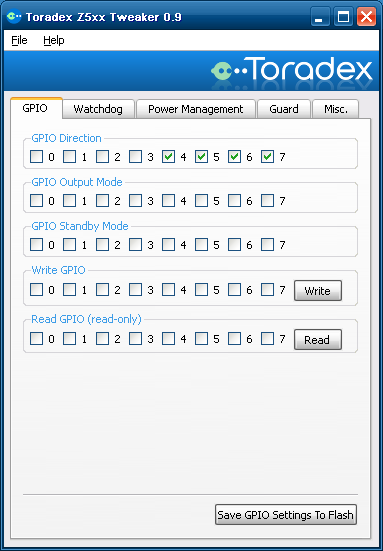 The GPIO tab can be used for set the GPIO direction, output mode and the standby mode. For test purpose, the program allows to change the GPIO output state and to read its state. This tab allows to change the watchdog parameters and the allowed watchdog serve source. With the Serve Watchdog button, the watchdog can be served by using the feature report message. 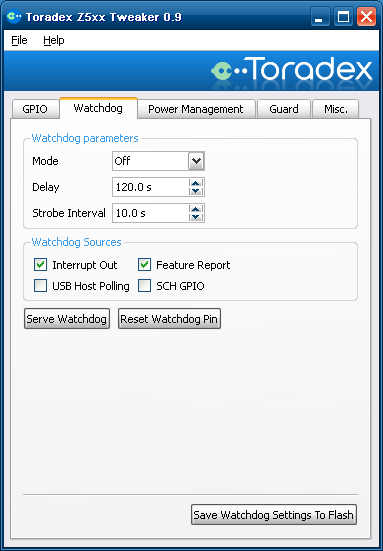 Attention: Please set the watchdog parameters very carefully! If the delay or strobe interval time is set to tight, the system might not be able to boot anymore correctly. If you are not 100% sure of the correct setting, please try them first without saving to the flash. In this case, you can restore the previous settings by removing all power supplies. 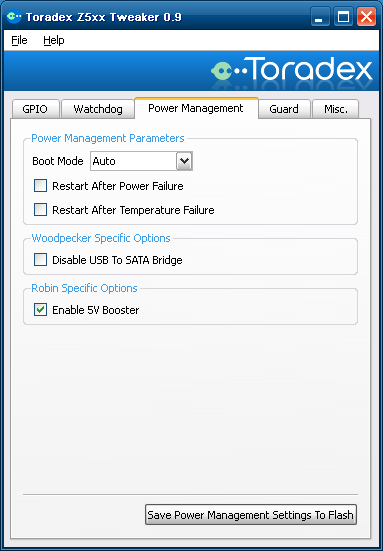 This tab is used for the settings of the [[Toradex Z5xx Guard Service (Woodpecker, Robin)]]. 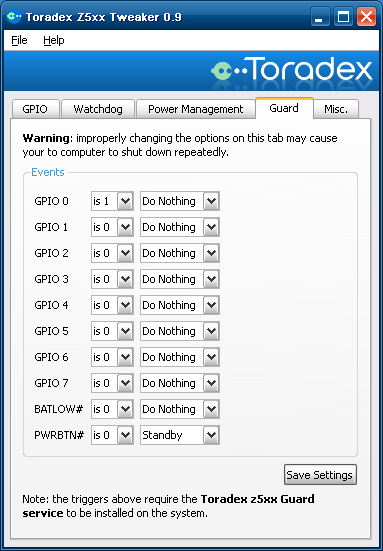 This service routine needs to be installed if the power button, battery low signal or one of the GPIO signals is used for shutdown the system or set it to standby. By pressing the Save Settings button, the settings are written to a file. Guard service will read the settings during the next restart of the operating system. Additional to the feature report settings described in the data sheet of the module, the Tweaker Tool allows the changing of the Embedded Controller serial number. The customer is allowed to change the serial number according to his needs. This serial number is not used by Toradex to identify the production of the module. For saving the serial number to the flash, the Save Misc. Settings to Flash does not have to be clicked. The settings are written to the Flash directly after finishing editing the serial number field. Important: The writing of the serial number reinitialize all Embedded Controller settings to the factory default value.